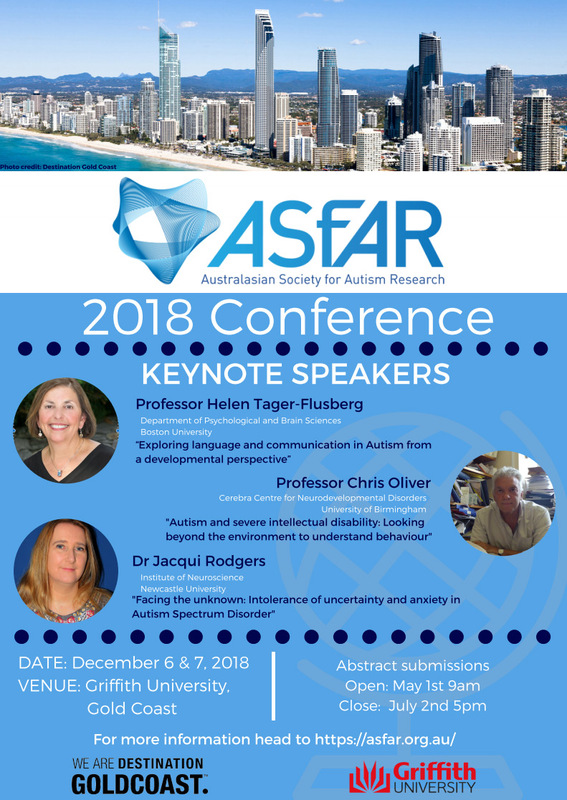 The Australasian Society for Autism Research (ASfAR) Conference was held at Griffith University, Gold Coast, on 6 & 7 December 2018. Gold Coast is a tourism hub with a wide array of accommodation from budget to luxury located in close proximity to Griffith University. Excellent public transport (buses and light rail) are available and link the campus to Surfers Paradise, which is located 15 minutes away by car. Below is a list of examples of accommodation located within 15-20 minutes transit of campus. – Griffith University Village: offers a range of accommodation options from single rooms within an apartment from $65 per night; double rooms $90 per night; or five bedroom apartments at $270 per night. This would offer an affordable option for students/scholars and is a 10 minute walk from the proposed venues. Limited wheelchair access. – Mantra at Sharks: from $124 per night – 8 minute walk to Griffith University, Gold Coast University Hospital, and light rail. Full wheelchair accessibility to hotel and rooms. – Meriton Suites Southport: from $125 per night – 13 minute light rail (operates every 15 minute). Wheelchair ramp access to hotel. Larger room recommended. – Meriton Suites Broadbeach (1,2,3 Bedroom Apartments): from $185 per night – 30 minute light rail (operates every 7.5minutes). Wheelchair ramp access to hotel. Studio suite recommended for full accessibility. – Mantra on View Surfers Paradise: from $134 per night – 19 minute light rail (operates every 15 minutes). Wheelchair ramp access to hotel. Limited availability of rooms with full accessibility (enquire with reservations). – Novotel Surfers Paradise: from $155 per night – 21 minute light rail (operates every 15 minutes). Wheelchair ramp access to hotel. Two fully accessible rooms (pending availability). – Surfers Paradise Marriott Resort and Spa: from $264 per night – 18 minute light rail (operates every 15 minutes). Wheelchair ramp access to hotel. Two fully accessible rooms (pending availability). – Hilton Surfers Paradise (1,2,3 Bedroom Apartments): from $219 per night – 21 minute light rail (operates every 15 minutes). Wheelchair ramp access to hotel. Four fully accessible rooms (pending availability). Light rail (trams) – see https://ridetheg.com.au/ for information regarding fares, planning your journey, station locations and more. All stations are accessible via ramps to provide improved access for passengers using mobility aids (wheelchairs, scooters or motorised vehicles).